First-years, sophomore and juniors are in the thick of room draw for next year. Given the random assignment of numbers, everyone hopes they’ll get the magic number one (or at least one of the top 20 or 30 shots at their dream housing), since some housing arrangements are definitely better than others, but it’s hard to get truly bad housing. With 98% of the student body living on campus, the Res Life staff and Housing administrators have a big responsibility managing first-year housing (how do you assign people to live together who’ve never met? ), special interest houses (9 languages, environment, substance-free, queer studies, to name a few), group interest blocks, social houses, and then just regular draw for singles through quads. Battell! 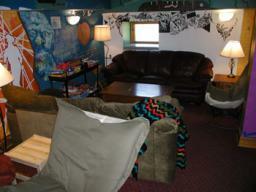 Small rooms that squeeze two people into each = hanging out in the hall and lounges. As the biggest first-year dorm, I was happy to be assigned there my first semester and to have worn my B2S badge ever since (the lingo goes Battell – floor # – North/Center/South, i.e. B1C, B2N, etc. Note: B3C is usually referred to as “the Nunnery,” given it’s being an all-women floor). Photo above, left. Gifford. Suites and pretty good singles, but underrated for its great lounges (each have balconies with spiral staircases), study rooms, convenient lecture hall, a small movie theater, and the Gamut Room (student run restaurant, performance venue, and meeting space; picture right). Russian House. 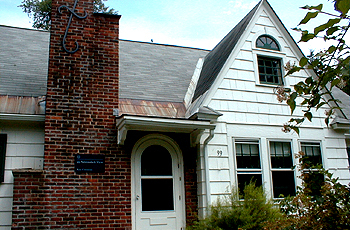 “Russkii dom” is one of the cute little houses that dot the Middlebury campus: full kitchen, living room, dining room, 2 bath, and rooms for 5. To get this one, you’ll have to be able to keep the language pledge (i.e. only speak Russian inside), but there are plenty other houses (interest houses and not) you can get. Kidding. 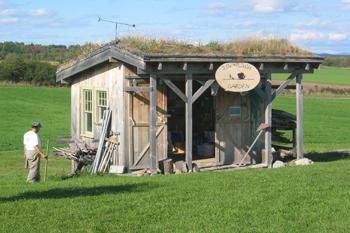 That’s the organic garden shed. This entry was posted in Student Life and tagged houses, Housing, singles, suites on April 22, 2011 by Casey Mahoney. The Fun of Being a Ross-er! Middlebury College is residential campus, with 98 percent of the senior class living on campus. Our housing system is based on the “commons system.” I haven’t seen the Harry Potter movies, but some describe Middlebury’s system as similar to Hogwarts School’s. We have five commons, Atwater, Brainerd, Cook, Ross, and Wonnacott. Each has a dean, faculty heads, coordinator, commons residential advisors (CRA), first-year counselors (FYCs), and residential advisors (RAs). FYCs and RAs are usually well-trained Middlebury juniors and seniors who live in freshman and upper-class housing respectively. The idea behind the commons system is to create smaller and more integrated communities within our already tightly-knit community. Around 450 students are assigned to each commons with their own dean, faculty heads, CRA, FYCs, and RAs. 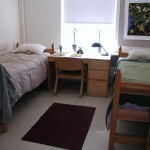 As a freshman, you’re most likely to share a room, but your options improve every year. Sophomores can choose singles or doubles, shared suites, or houses with friends. There are academic-interest housing as well as social houses, as well as houses for every language taught here! The latter aren’t necessarily tied to a commons. Commons host dinners with remarkable visiting speakers. These dinners provide opportunities such as eating with Victor Zhikai Gao, translator for Deng Xiaoping (China’s Premier during its ’80s economic reforms). For the student interested in Chinese politics and history, that is one amazing event! Commons also sponsor events such as trips to Burlington, the largest city in Vermont, 45 minutes north of Middlebury. I live in Ross Commons, and I love it! My freshman year I lived in a suite with five other girls whom I consider my “Middlebury Family.” One room combined Afghanistan with South Burlington; another, CT with NYC/Thailand; and the third, NYC with Kenya. We had an amazing year together. Although I chose a single room as a sophomore, some of my close friends lived on my floor. I studied in Egypt my junior fall and roomed with an Egyptian, returning to Ross in the spring. You’re only required to live in your commons for the first two years. You then can live anywhere on campus while retaining your affiliation with your commons, and receiving notice of dinner speakers, and generally staying in touch, especially with your dean. I stayed at Ross, which has great senior housing choices (my personal bias). I live in an enormous single twice as big as my freshman double! It is great, with the best view of the Adirondack Mountains as the sun slowly disappears beyond. Vermont’s unpredictable weather patterns brought us snow just a few days ago—and I didn’t even have to leave the building! I went to the dining hall in my PJs while others bundled up. I happened to have only one class that day—and we meet at Ross! I spent the rest of the day in the study room, working on my grad school application. This entry was posted in Student Life and tagged Commons System, Housing, Ross on November 16, 2010 by Shabana Basij-Rasikh.